The rods on the left side are known as the “defensive 3-bar” and the “defensive 2-bar,” named for their proximity to the goal and the number of players attached to each. Near the middle of the foosball table is the “midfield row,” the bar with five players that most often receives the serve and sends it to the next row: the “striker row.” This last bar is on the far right, closest to your opponent’s goal, and holds three players. These are the players who will most often drive the ball into the goal. The abacus is used to keep record of the score of both teams. These are located on each side of the table behind the goal to help you keep track of the score. This one is pictured on the Garlando World-Champion Foosball Table. Here is a summary of the official foosball rules, as stated by the International Table Soccer Federation (ITSF). These are the basic rules for how to play foosball, but for advanced exceptions and game play, reference the full official guide. Players flip a coin to determine who goes first. Balls are served through the serving hole. Game play continues until someone scores, the ball is hit off the table, a team calls for a time out, or the ball is declared “dead” (immobile in a location where it cannot be hit by either team). New serves are delivered by the team last scored upon. To score a goal, the only requirement is that the ball must enter the goal. It still counts as a point even if the ball bounces out of the goal after scoring. No spinning of your rods to advance the ball. No moving the foosball table, banging on the sides, or slamming rods back and forth against the table walls (called “jarring”). No touching your opponent’s rods. No distracting your opponent—keep it sportsmanlike! Shoot the ball within 10 seconds of possession on the midfield row and within 15 seconds on the others. First team to five points wins the match. The losing team serves up the ball for the next round. 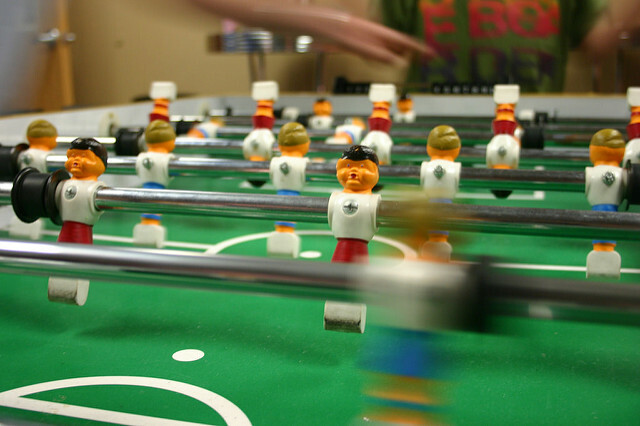 One-on One – The most common way to play table soccer is one on one (AKA singles). Each player controls all four bars for their team and must switch between defense and offense as the ball moves. Two-on-Two – Another common variation is two on two (AKA doubles). In this table soccer variation, each player keeps his or her hands on the same bars the whole time. This allows each player to focus on one duty: defense or offense. Switching positions is only allowed in-between ball serves or when an official time out has been called. Goalie War – A less common variation is “goalie war,” a one-on-one game where players use only their defenders. Normally you play Foosball one-on-one or on teams of two. This extra large table is extended so up to eight players can join. 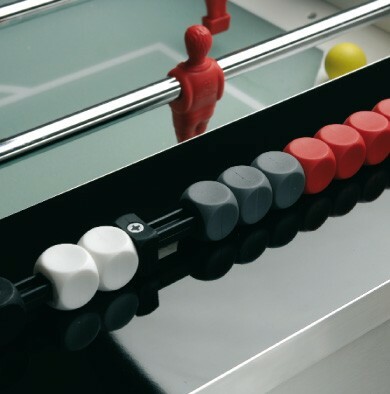 Check out more more foosball tables here. Now you know the basics of how to play table soccer. Ready to give it a try but not sure where to start? Here are the top three Foosball tables we recommend. 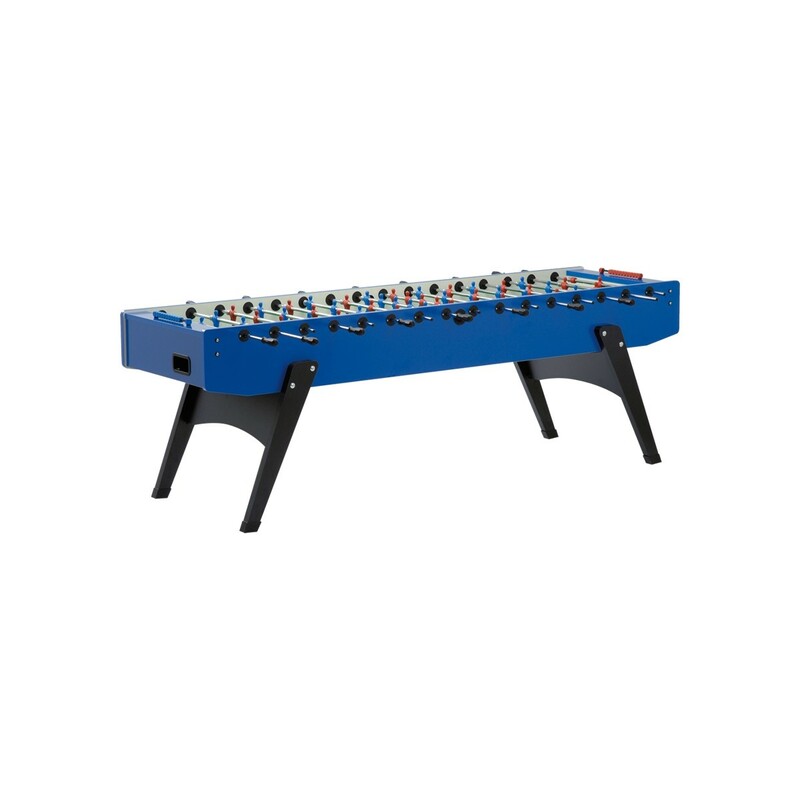 Table soccer is a great game for the whole family, so invest in a game table for your living room today. This entry was posted in Foosball by admin. Bookmark the permalink.